Today’s announcement that Social Security recipients will receive a modest increase (1.7%) in their cost-of-living adjustment (COLA) was a small but welcome boost for seniors who are seeing prices increase on necessities, from health care to food. However, even this modest increase could be jeopardized if proposals floating around in Washington to “tweak” the current COLA formula by tying it to the so-called “chained CPI” are passed. Senior advocates and retirement experts say the current formula, the CPI-W, is already inadequate. Higher health care costs and expenses seniors face are not accurately addressed in the CPI-W. The current formula, used for today’s announcement, already badly understates the inflation experienced by seniors and disabled Americans, who make up the majority of Social Security beneficiaries. However, the change some in Congress want would exacerbate this flaw in a way that is particularly damaging for women who, because of their greater life expectancy, receive benefits over a longer period of time. The typical 65-year-old, who filed for benefits at 62, would lose about $130 per year in benefits. By the time that senior reaches 95, the annual benefit cut will be almost $1,400, which is a 9.2 percent cut. The purpose of an inflation adjustment is to ensure that the value of Social Security and other modest but vital benefits does not erode over time. The proposal to switch to the chained CPI would, over time, slash the benefits of both current and future beneficiaries. Specifically, it would cut the basic benefit—currently averaging a modest $13,500 for all beneficiaries—and break the bipartisan promise not to cut the benefits of current seniors. Although some in Congress may say this is a modest tweak or a change to more accurately reflect inflation, nothing could be further from the truth. A chained CPI means cuts are larger the longer you receive benefits. One of the most problematic aspects of the chained CPI is that the cuts are larger the longer you receive benefits – meaning that the chained CPI would disproportionately hurt many women, veterans, people with disabilities, and others. 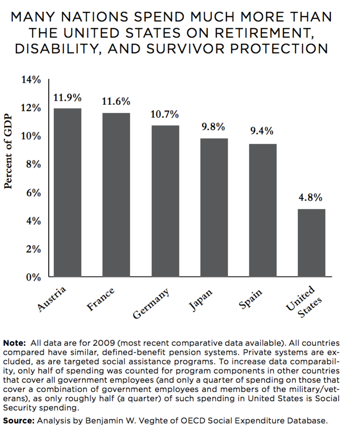 For example, veterans wounded in combat and others disabled at young ages would be disproportionately hurt. Seniors, especially women, who live long lives would also be hurt disproportionately. The AFL-CIO Executive Council supports an across-the-board increase in Social Security benefits. This post originally appeared in AFL-CIO Now on October 16, 2012. Reprinted with permission.